Who can live in the Village? Age limits applicable to BallyCara are minimum age of 65 years. Residents must be a minimum of 65 years of age and also provide a letter from their General Practitioner stating that the type of accommodation chosen is sufficient for the level of care they require. In the case that you do not fit this criteria, please speak with us and we will try our best to help you. What happens to my Villa or Unit if I go away for holidays? Whilst you are away on holidays our team of dedicated staff ensure your home remains safe and secure. We do request that you notify Reception of your intention to go on holidays to allow us to plan accordingly. Do you offer Respite, HomeCare & Residential Aged Care? The Award Winning Hibernian Aged Care Facilities (HACF) are part of the BallyCara Retirement Living complex and offer residential care through our low care, high care, dementia and respite services. 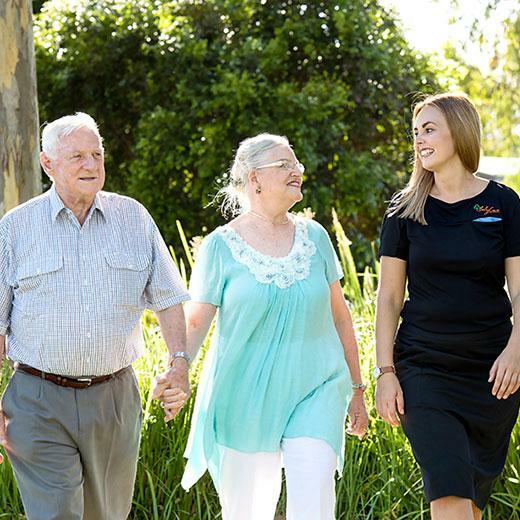 BallyCara HomeCare provides HomeCare services on and around the Redcliffe Peninsula as well as Moreton Bay, North Brisbane, Logan & Gold Coast regions including eligible Residents within BallyCara Retirement Village. Can a pet reside in my Villa, Unit or Apartment? BallyCara Retirement Village is a pet free Village. However, upon application Management may consider small birds. When moving into BallyCara you are purchasing the licence to reside within the village, Lease hold. What do your monthly fees cover? Building insurance & maintenance of the property including fittings and fixtures existing in the property. The costs of maintaining, monitoring and responding to the Residents’ emergency alarm system 24/7. What are your exit fees?